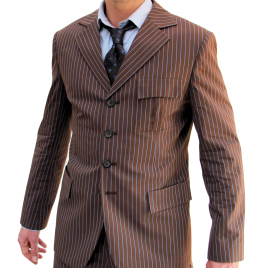 Whether heading to the office, or shooting off for a day out in the TARDIS, you will be find the Tennant suit the perfect item to wear. My blue one was beautifully made to fit my ever expanding measurements and it has some wonderful detail - I especially like the top curved pocket and fantastic looking tailored back. I couldn't recommend higher! And a bargain for a made to measurement item! P.S. Get the Time Lord tie too, it really completes it nicely!